Rest assured that when you board your dog or cat (or both!) with us, they will receive the highest quality care. We love our pets, too, and understand how much you care about yours. That’s why we set high standards for all aspects of our pet care services. Free basic bath and brush out with any 7 day stay! 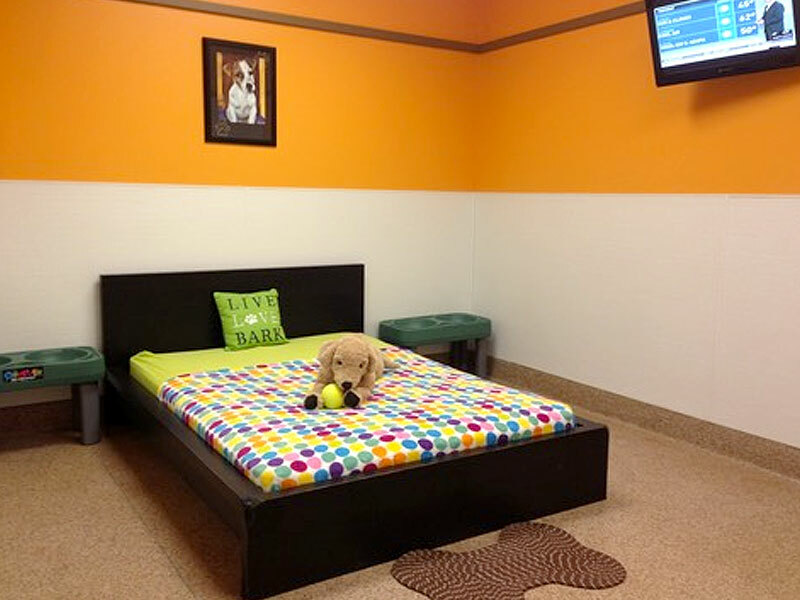 The view from inside one of our Premier Pet Suites (Angola location). There are some things that we just think should be included in the price of a hotel suite. While we do offer some services and amenities for an additional fee, we’ve chosen to provide the most important elements of comfort – at no additional charge. Do you have more than one pet? Boarding a family of multiple pets can be very expensive! 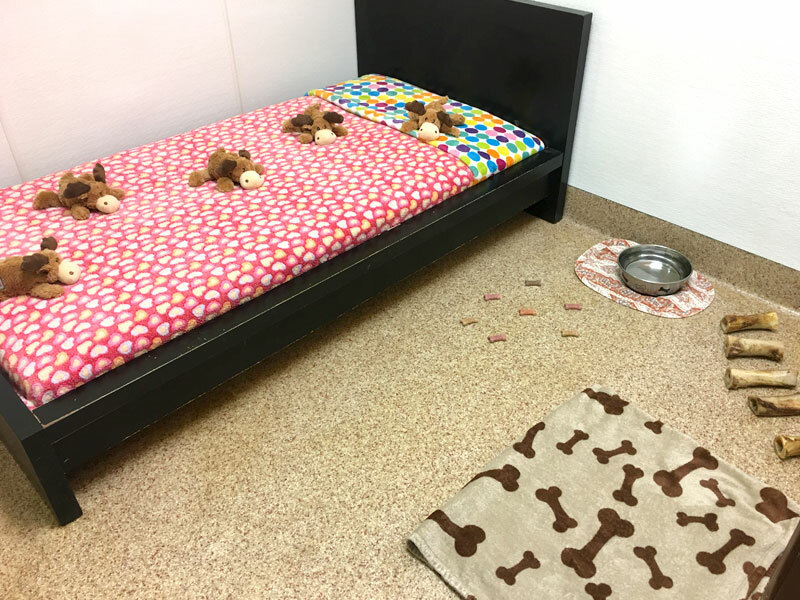 Take a close look at the rate options for two or more pets from the same household, boarding at the same time and sharing the same suite. Our per-pet incremental fees drop dramatically after the first family pet. Multi-pet families have often been forced to turn to less desirable options for their pets when they go out of town, including relying on well-meaning but untrained family members or friends who may be less than reliable. Just because your heart is big and you have many pets doesn’t mean you shouldn’t be able to give them the finest resort experience. We think you’ll be impressed with our affordable multi-pet rates. Anytime our lobby is open, you are free to come in for a tour! Of course, there are times when we tend to be busier with guest check-in and check-out (usually early in the morning, late in the afternoons, and holidays), and there are times when our guest suites need a little extra “housekeeping” (usually shortly after room service meal delivery). During these times, we ask that you be patient with us while we tend to our current guests and their human family clients first, but we know you’ll understand. When your pet is with us, he or she will always come first, too! We’re proud of our resort and our staff, and we welcome your visit at any time during business hours. Please note that we close weekdays 12:00-1:30 for lunch. Our resort works similar to a hotel. You are welcome to Check In/Out anytime during our lobby hours. However to ensure your pets room is ready for their stay, reservations are required for both arrival and departure times from the resort. Rates are per day, if check-out is before noon Monday-Saturday the daily rate is waived. Sunday the daily rate applies to all boardings. A Deposit is required to book a stay in a suite or during peak seasons. For more information on our polices please read our Pet Services Agreement.